Bronstein approaches his interest in architecture through a wide range of media – from drawing, sculpture and installation to performance. 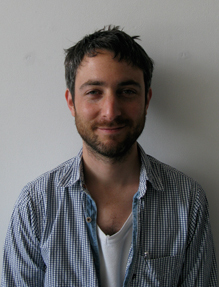 One of his key interests is how architecture has the ability to intervene in personal identity, inform our movements, behaviours, and social customs. Proposal For A Piazza In Turin is a draft plan for a public sculpture, an architectural intervention that would divide a traditional Italian square into segmented parts, redirecting how the space might be navigated and used. Bronstein’s Plaza Monument is a proposal for a classical piazza. Whilst drawing from the Italian traditions of perspective and geometric purity, his quotes range from Renaissance design to modern masters such as Aldo Rossi. Executed in watery ink, Bronstein’s plan conveys his monument with an ephemeral elegance, framing the imposing as delicate opus. 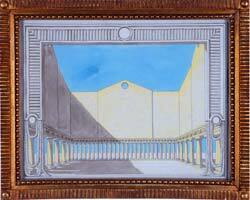 Conceiving the public space as theatre, Bronstein curtains his edifice with a decorative frieze; the subtle angular shadow infringes on the arena with an impending drama reminiscent of De Chirico. Bronstein uses architecture as a means to engage with power: of history, monuments, and the built environment. Using pen and ink on paper, his acutely drafted drawings capture an archival romance of a grand age, a nostalgic longing for the imposing and imperial. Adopting the styles of various architects and movements, his elaborate designs become plausible inventions, both paying homage to and critiquing the emblems of civil engineering. 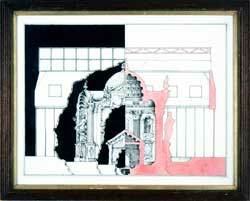 In Elevation and Interior of Historic Building, Bronstein’s plan borders on abstraction. Depicting the history of architecture from a simple hole in the ground to a hut, Byzantine temple, Baroque cathedral, enshrined in the cold industrial shell of a modernist shed, Bronstein dissects the lineage of ideas and ideologies, all pastiched together with a dandyish pomo flair. 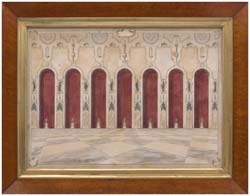 Pablo Bronstein works primarily with 1980s postmodernist and 18th century post-revolutionary French architecture. Finding parallels between their decadent pretensions and their demonstration of precise moments in history via formalist structure, these periods, for Bronstein, define what it is to be a citizen, embracing the heroic as a uniting social value. 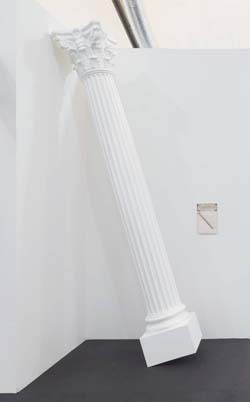 Monument In The Style Of Graves On The Debris Of The Bastille is based on Jean-Pierre Louis Laurent Houel’s The Storm of the Bastille; Bronstein gives the famous painting a facelift à la pomo architect Michael Graves. Using Graves’ trademark pastel tones and stylized patterns, Bronstein authors an alternate history: breathtakingly impressive, and hauntingly crypt-like. 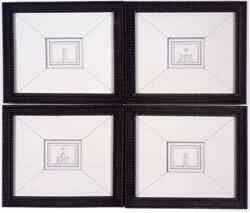 Pablo Bronstein’s 4 Facades is an original sketch for an architectural installation. Intervening with life-sized space, the installation posed a skyline physically cut out of a wall. Considering the drawings as ‘dress rehearsals’ to the final piece, Bronstein approaches architecture as a performative entity. 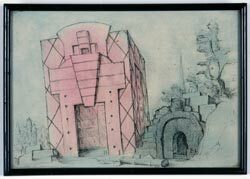 Presenting popular buildings as pared down symbols, Bronstein plays with ideas of scale, his tiny blue prints framing the colossal as minimalist suggestion. Intervention For A Piazza In Turin presents the same project design as Proposal, but from a more obscure angle that emphasises the dramatic scale and authoritarian power of Bronstein’s intersecting walls. 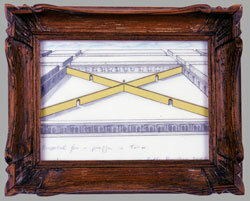 Rendered on tracing paper, the distant city horizon and classical square are made passive and delicate, dominated by the opaque gouache barriers. By giving his intervention concrete form, Bronstein wittily claims the territory with an X, implicating a Machiavellian control in the way public space is conceived and developed. Bronstein’s architectural drawings explore both the functionality of civic space, as well as the inherent values associated with the styles of different times. His work often combines reference to a multiplicity of design aesthetics, ranging from the imposing authority of neo-classicism, the ornate dynamism of baroque, and the decadent pastiche of postmodernism. Through these ‘moshed up’ embellishments, Bronstein highlights the way building facades convey ideas of wealth, power, or grandeur. Though architectural fashion mirrors social values, it also represents the will or vision of the architects and commissioners who impose their ideas on the public – with the intent that their work will last for generations. Bronstein’s drawings critically examine this subjectivity. 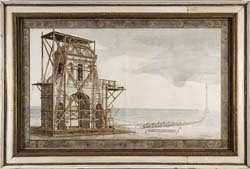 Though Pablo Bronstein’s Relocation Of Temple Bar looks like an aged document, it depicts an overlap between historical and current events. Temple Bar was one of London’s seven medieval gates and was located at the juncture of Fleet Street and The Strand. The building depicted is Christopher Wren’s design which replaced the original after The Great Fire. To accommodate increasing traffic, in 1878 the monument was dismantled for preservation. Its 2700 stones were purchased by Sir Henry Meux in 1880 and the gate was duly reconstructed at his Theobald Park house. In 2003, the building was reacquired by the City of London, and now stands at Paternoster Square. Bronstein imbues the Relocation of Temple Bar with the epic heroicism of legend.